How stunning is this.. they don't design stamps like this anymore do they.. mostly now all junk and wallpaper as I (and others) call them. Many thanks to Jane from Canada, She has sent the following.. I hope you enjoy it as much as I did. Occasionally, a collector will find a miniature masterpiece that beautifully illustrates the intended story. 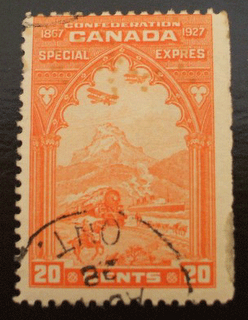 I believe that this Canadian stamp issued in 1951 is one of these tiny gems. It is an engraved stamp in an eye-catching shade of ultramarine blue. The vibrant colour draws the eye through the frame towards the central image. The viewer is encouraged to imagine that they have rowed out to sea in a small boat. Nearby, is a solitary fisherman in his dory. He is wearing the traditional waterproof sou'wester and hat to keep warm and dry. The sea is so rough that an oncoming wave threatens to swamp the tiny vessel. Despite the less than ideal conditions, he has begun the long , slow process of hauling in the net. Gradually, the net spreads out around the tiny vessel and day's catch is revealed. In the net are sixteen different types of marine life. (The viewer assumes that the fisherman will release the seal caught in the net.) Cod, halibut , mackeral, and herring are easily identified. There are also lobster, scallops, shrimp , clams and even a few freshwater fish in the net. The fisherman has been unbelievably lucky or has he? Suddenly, the viewer realises that this is actually an allegory. The carefully crafted scene recognizes the role of fishermen in the country's economy and illustrates the abundance and diversity of Canada's fisheries. What an imaginative way to showcase Canadian fishing in the 1950s. Thank again Jane.. and if anyone wants to send me a stamp (scan) and a text to accompany it I will happily share it with all my readers. Hello, I hope you have read Part I .. I will leave it a few more days before I comment further.. some good responses so for and I am compiling them.. as some good thoughts to share with you. I also updated the web site http://www.cddstamps.com/ and made time to pack up 27..at last count, free packs of stamps and blog prizes. Be patient with me .. I am nearly up to date with sendings and emails..
Hello, well another week just shot by. No time for stamps and I still have unfilled free packets to send.. apology if you are one of those waiting for stamps. and, bigger apology of you are waiting for a prize.. I still have not mailed them.. shucks I am getting behind.. but I love my day job that is my only excuse. That and I have to go to business dinners and drinks after work ... well someone has to do it... I do hope you will be patient with me. 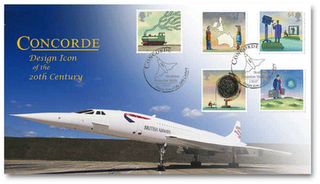 To stamps and a new competition.. "Grade a Stamp". What about this.. So you thought I was a little hard in my comment last night.. 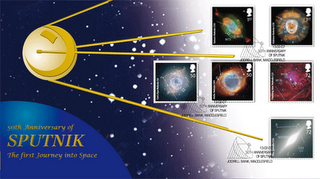 I don’t think so.. of the 12 stamps presented you can only fully see one of them, reading top left to right . this is my view of the stamps..
top left - Poor postmark from what can see. Cannot see all the stamp. top middle - Postmark basically ruins the stamps Cannot see much of stamps.. but not missing perfs top right Damaged right hand top corner..
middle left - What a lovely postal franking.. yes ruins stamp. Through it away. As a prize.. I will give these 11 stamps (ignore duplicate) to you if yours is the first email to cddstamps@gmail.com and you list the SG numbers and SG pricing.. just tell me what Cat year you are using…. Will publish results in a few days..
are you buying this rubbish!!!!!!!! I really don't know if am a fool or what... no I am not.. I know that.. I just sold and posted another of my GB specials.. well, well over 100 GB Pounds of catalogue value for 10%cat and I think the condition was pretty good.. no tears.. no creases that I saw from a quick look and full perfs.. you know.. good stamps you would be pleased to have in your collection.. I was thinking, well I am selling these lots too cheap.. having looked at eBay these past few days... then I thought I'd look at another auction site.. I won't name them as they have no control over the crap that is listed there.. ok some might be ok.. but look at this ...... it makes my blood boil.. The internet is a wonderful medium for all of us.. yet some brain dead can post 12 stamps.. most of which I would probably trash .....and ask for money for them,... please please dont buy this stuff.. if you want to collect stamps.. I will send this to you for free... seriously.... . see my free pack.. I am very serious.. I want people to enjoy stamp collecting and not feel ripped off in days. weeks, years to come.... and if you buy this rubbish you will feel that way..
tell your friends and stamp collecting colleagues.. tell the stamp club boards you read.. we have to stop this rubbish being sold and the rip offs many of you must be unknowingly experiencing. For the quiz on 13th February, The first recorded association of Valentine's Day with romantic love is in Parlement of Foules (1382) by Geoffrey Chaucer. and finally.. on February 8th I asked why was I two days late in showing the two QE II definitives.. the answer was that I was 2 days late remembering the 53 rd year of Queen Elizabeth ascending the throne, on Feb 06. Anyway here is the booklet.. 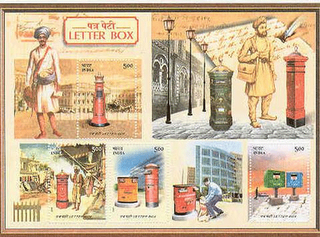 I am not going to write about it other than to say it was issued on 16th January and the Love stamp is the same as the 2005 Smilers pictorial definitive except that it has a ellipsed perforations and solid phosphor bands whereas the 2005 definitive had ellipses and vignetted phosphor bands. If I get the time tomorrow I will try to see if I can scan the stamps so you can clearly see the differences I am talking about. How do I know this trivia you may well ask????. Well I read Machin Man .. and if you look at his web site at http://www.gbmachins.co.uk/html/news_04.html you will learn this and more. If you read his blog http://machinmania.blogspot.com you will never be short of the latest Machin News. I know I mention his sites a lot and yes he is a mate you could say but I also know he has THE news on Machins and I want you to know that too. hello, well I guess there are some of you who look at http://www.history.com/tdih.do I do occassionally, as I find it very interesting and educational.. but why am I showing this stamp tonight.. I hope you can find out by looking at the link and that you enjoy the video clip about King Tut!! Anyway, not to get on my whinge wagon about Royal Mail and their stamp issuing policy.. but who can tell me the other two anniversaries celebrated in that 1972 issue.. like, how momentous an occassion where they both..?????.. clue.... think about your answer .. and try to convince yourself the Royal Mail are no better now than they were 34 years ago!!! Oh I do like to be mischievous writing these pages... all emails to cddstamps@gmail.com will win a prize.. if you include your mailing address.. and first email will win a mint set of the issue, second email will win a used set and rest will win any GB commemorative stamps I can find.. ha ha .. there are millions of them..
Hello, have you bought a Valentines day card for your loved one(s) big smile... I was reading about Valentines day and learned that 85% of cards are bought by women. If that is the case, why am I not getting any ...big smile... (cards!!) come on you guys out there... own up.. how many are you getting.. you surely must be getting my share......... and you ladies.. why are you not sending me a card.. The first recorded association of Valentine's Day with romantic love is in ..what text??? and who wrote it??? and in what year ??? Whan euery bryd comyth there to chese [chose] his make [mate]. Emails to cddstamps@gmail.com with your mailing address please..( so I can mail you the cover) and when you find the text that this question came from I think you will enjoying reading more about Valentines day. I know what it is.. do you??.. 6th correct answer with mailing address and it is yours.. maybe something different for your collection.. I'll tell you in a few days what the bars represent... best wishes.. enjoy your stamps..
Hello, well I was the winning bidder for this stamp.. and I am quite pleased with that. After all, how often does one see this stamp with one's initials. MD for Michael Dodd. Ok a bit self indulgent and even sentimental, but hey... it amuses me. I'll have it framed I think.. what do you think I should do with it? Quite good used condition as well I thought. 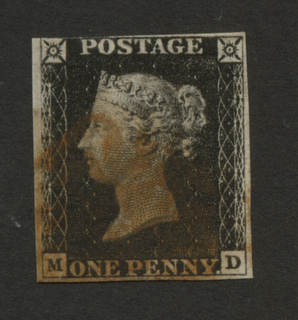 Now for some thoughts about the Penny Black.. while we all know it was the first postage stamp, how much do we really know about it I wonder. For example, 1) who was William Wyon? 2) Who were Perkins, Bacon and Petch? 3) who was Henry Coubould? 4) who were Charles Heath and his son Fredrick? 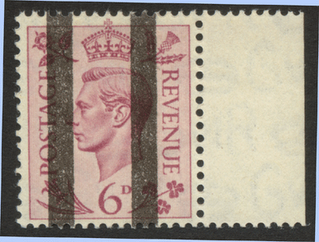 and finally, ok this is easy.. 5) how many stamps were there in a sheet of Penny Blacks? Five questions but surely, to enjoy stamps is also to understand the people involved in the beginning of this wonderful hobby. Hello, so what am I 2 days late on.. here are two stamps that maybe give a clue..
let me know and I may well find a way to send you some of these definitives, plus other watermarks........... second email to cddstamps@gmail.com will get the stamps..
just a short piece tonight.. I am still celebrating England winning a cricket match and getting into the final for the one day series with Australia ..
what happened to stampoffers.com.. I just logged in to see what was there.. and not much.. looks like a really nice new site I must say but all history has gone.. what did I miss.. so few stamps for sale there.. This article from my guest writer Jane from Toronto, Canada.. thanks Jane, I really enjoyed this and I hope everyone else does as well. Occasionally, a collector will find a miniature masterpiece that beautifully illustrates the intended story. I believe that this 1927 Canadian Special Delivery stamp, part of the sixtieth anniversary of Confederation set, is one of these tiny gems. It is an engraved stamp in an eye-catching shade of orange. The warm colour encourages the viewer to look more closely and draws them towards the ornately carved window that frames the scene. They are invited to stand at the window, perhaps leaning on the ledge, surveying the vista spread before them. Outside the window, just beyond the tree-tops, Canada emerges. In the foreground, a horse and rider gallop across the landscape. A train thunders along the railroad tracks. Farther on a dogsled pulled by a team of huskies glides across the tundra and beyond that is a steamship cutting through the waves. Soaring overhead, somewhere between the distant mountains and the window, are two biplanes. Suddenly the purpose of the majestic vista is revealed. It is an allegory about Canada and the Special Delivery mail service. Canada has grown in the sixty years since Confederation and so have postal services. Special Delivery will deliver mail and packages across the country and beyond. They have the transportation network to do the job. What a charming way to impart a very important but mundane message. Even if the allegory is a bit too subtle, it is still a lovely engraved stamp."" Hello, one of the things about writing a blog is sometimes one does not know what to write about.. as in there is too much to write about so what do I chose.. ??? I am in that wonderful position.... so thanks to all who send me scans of stamps and ideas and articles.. I will get round to most in good time.. 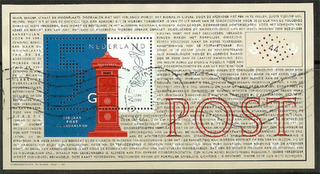 This MS is one I was sent after I wrote about Letter Boxes on stamps. Enjoy.. I have spent some time reading about Machins again today.. so much happening on the scene this year.. as I said last night, do read the Machin Mania blog.. it is very good. the stamp blogs.. I read Machin Mania..... excellent .. you have to read this if you collect Machins.. lots of news about the new release with the increase in UK postal rates in a few months time, and also news about the issue for the 40th anniversary of the Machin stamps themselves. Some excellent scans as well. Going to be an expensive year me thinks .. just with Machins.. I also read AKPhilately.. Lions on stamps is a topic Adrian has been talking about and his articles are so interesting and the scans of stamps are truely brilliant. Both can be found from my links.. I will be updating my web site with more details of these as well if you are interested. 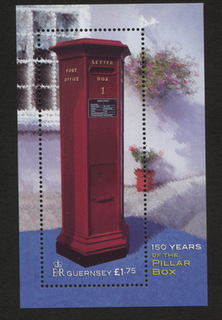 Hello, and many many thanks for the emails on stamps on Post Boxes.. I will show some over the coming days.. here is one.. rather nice MS I think.. many thanks for sending this ..
Hello, Post (Pillar) Boxes tonight, as I got this stamp M/S in my copy of the Australian Stamp News..